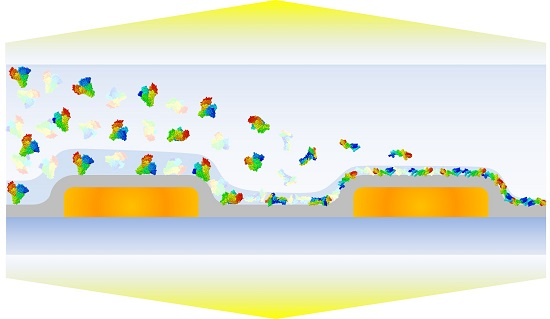 Nanoplasmonic sensors are a popular, surface-sensitive measurement tool to investigate biomacromolecular interactions at solid-liquid interfaces, opening the door to a wide range of applications. In addition to high surface sensitivity, nanoplasmonic sensors have versatile surface chemistry options as plasmonic metal nanoparticles can be coated with thin dielectric layers. Within this scope, nanoplasmonic sensors have demonstrated promise for tracking protein adsorption and substrate-induced conformational changes on oxide film-coated arrays, although existing studies have been limited to single substrates. Herein, we investigated human serum albumin (HSA) adsorption onto silica- and titania-coated arrays of plasmonic gold nanodisks by localized surface plasmon resonance (LSPR) measurements and established an analytical framework to compare responses across multiple substrates with different sensitivities. While similar responses were recorded on the two substrates for HSA adsorption under physiologically-relevant ionic strength conditions, distinct substrate-specific behavior was observed at lower ionic strength conditions. With decreasing ionic strength, larger measurement responses occurred for HSA adsorption onto silica surfaces, whereas HSA adsorption onto titania surfaces occurred independently of ionic strength condition. Complementary quartz crystal microbalance-dissipation (QCM-D) measurements were also performed, and the trend in adsorption behavior was similar. Of note, the magnitudes of the ionic strength-dependent LSPR and QCM-D measurement responses varied, and are discussed with respect to the measurement principle and surface sensitivity of each technique. Taken together, our findings demonstrate how the high surface sensitivity of nanoplasmonic sensors can be applied to quantitatively characterize protein adsorption across multiple surfaces, and outline broadly-applicable measurement strategies for biointerfacial science applications.